Cooking takes a lot of tools and if you want to get a great outcome it will take quite a few tools. Things like pots and pans can be extremely important, though you need something that works for your needs. Each one is designed for different purposes but figuring out what is the best ceramic pan can be difficult. We’ve gone through the process of finding high-quality pans and we’ve even taken a look at the features you need to know in order to choose the right one. Size: What size is the pan? How many inches is it around? This is going to help you understand how it works for your needs. It also means that you’ll be able to use it for a number of different meals or even snacks for yourself. Pieces: How many pieces are you going to get in the set? Will you just get one pan or are you getting multiple pans? This is going to help you better understand whether it’s a good value for the cost to you specifically. Color: What color are the pans? This is going to be important for your own personal preference. You’ll want to look at the color as a way to make sure they fit the rest of your kitchen, your pots and pans and whatever you like. Oven Safe: Can you put the pans in the oven? Putting them in the oven means that they’re more versatile for you. It also means that you can take pans directly from the top of the stove and put them in the oven. PTFE/PFOA Free: You want pans that are free of chemicals because they can cause problems for you or your family. They can get into the food that you eat quite easily if you cook with them, so it’s important to be aware. Dishwasher Safe: If you can put the pans in the dishwasher it means they’re easier for you to take care of and easier for you to clean. Not all pans can be put in the dishwasher but if this is important to you watch for it. There are many people who are looking for healthier methods of cooking for their family. That’s why they’re considering ceramic pans vs. Teflon. Not only are they healthier in some aspects, they’re also convenient, oven safe (in many cases) and a whole lot more. They’re great for cooking a range of different things. Just make sure you take a look at our list and see which ones are going to work best for the foods you want to cook. This 11” pan is designed to cook just about any of your favorite dishes. Made with a professional grade ceramic, this skillet is oil and scratch resistant so you get to use your favorite utensils as well. Made with PTFE, cadmium and lead-free materials, it’s also eco-friendly and 100% recyclable so you can feel great about using it for your family and the environment. Designed to be heat resistant up to 450°F, you can transfer anything you like directly from your stovetop into the oven. The silicone handle doesn’t get hot, no matter what you’re cooking and the silicone rim for the glass cover helps you with steaming and more. You’ll have 2.5” of depth and you’ll have a full 1-year warranty to try it out. Our budget pick is a simple, 8” skillet but it still gives you the features that you’re looking for. Completely PTFE and PFOA free, it’s also petroleum free so you can feel better about using this for anything you want to make. The silicone handle stays cool to the touch while you’re cooking anything you want and the pan itself is oven safe up to 350°F. When it comes to cleaning, you’ll definitely be off to a great start because you can put this pan directly into the dishwasher to get it ready for next time. The bright red color is fun and vibrant in your kitchen and the sleek white interior adds the perfect amount of contrast. 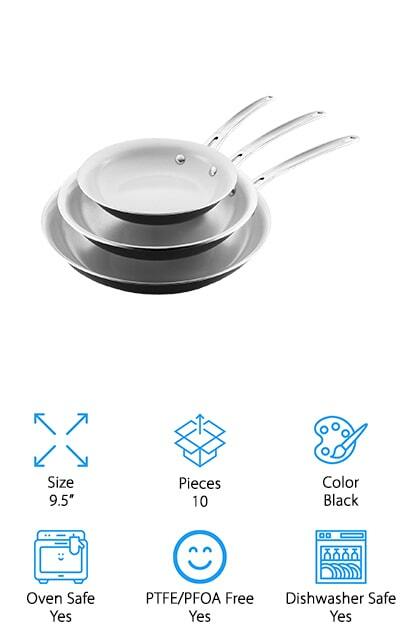 If you need a larger skillet there are even other sizes available in the same style and with the same company. This 10” pan is actually hand cast in Germany so you know it’s going to be high quality. On top of that, it has a professional ceramic coating that’s completely free of a number of common chemicals, including APEO, PFOA, NMP, NEP, and BPA. That means you can feel a whole lot better about using it to make meals for your family. On top of that, you’ll have a 4-ply ceramic coating on the interior that’s scratch resistant and even lifetime rated. The aluminum core helps add to the durability and makes it work for induction stoves. When you’re ready to make your next dish you can put this pan directly on top of the stove and then you can transfer it right to the oven up to 500°F. That means you have even more versatility with the foods that you want to make. 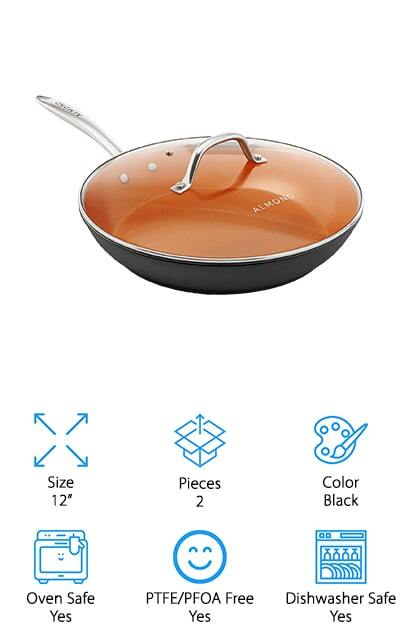 This copper pan is designed to make your favorite foods in no time at all, even eggs and omelets. 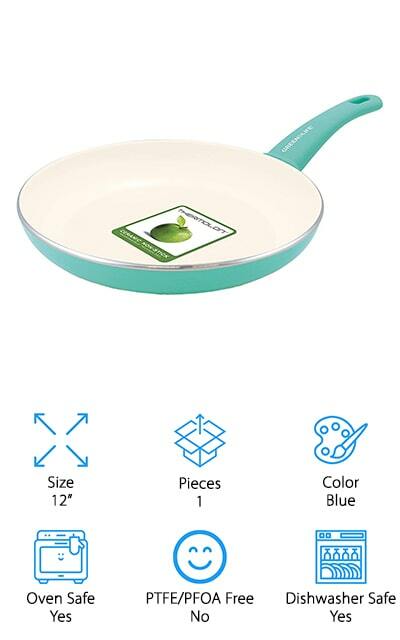 It also has a PTFE and PFOA free coating of ceramic on the inside to help your food not stick but to still keep the pan healthy for your family. You’ll have the exact level of thickness and dimension for each copper pan so you can get consistent cooking and you’ll have a tempered glass lid that is also oven safe up to 500°F. That means you can keep your food nice and hot and you can split your cooking between the stovetop and the oven. Whether you use a gas stove, induction, electric or even a grill you can use this pan with no problem. It’s designed never to oxidize or to tarnish, so you can continue to use it for a long time. Plus you can put it directly in the dishwasher when you’re done. 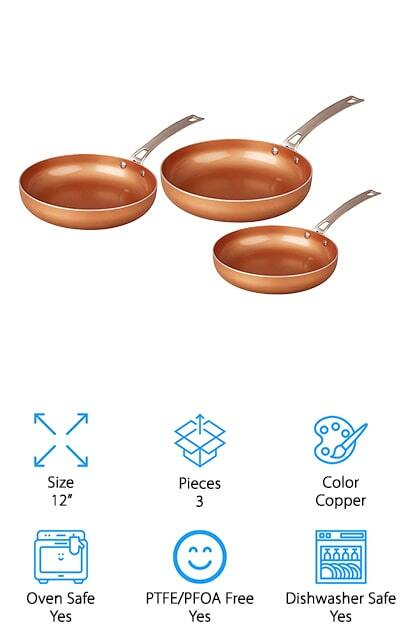 Here you’re going to get a set of copper pans that are designed to make sure you can cook everything you like best. 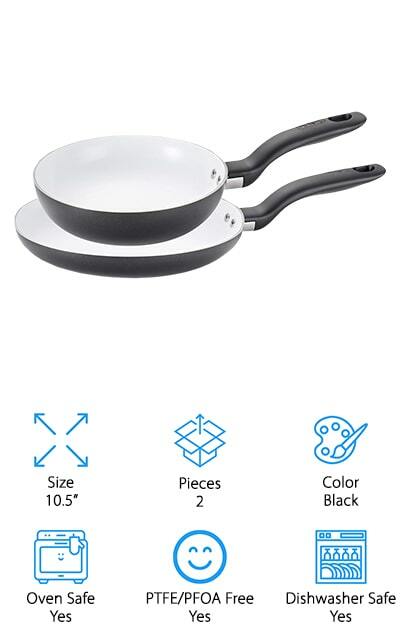 Made with ceramic coating that’s PTFE and PFOA free, these pans also have a fully polished handle made with stainless steel so they look sleek all the way around. 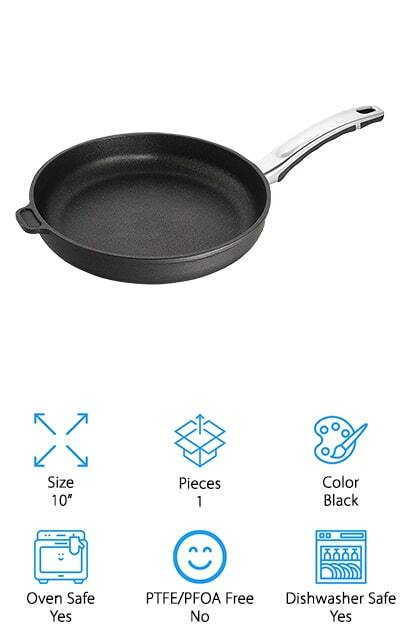 Induction capable, these are pans you can use just about anywhere and you’ll have the non-stick abilities that you’re looking for, but no chemicals. Safe to use in the oven and to put in the dishwasher, you’re going to have no problem finding some lids that make them even more versatile for different dishes that you want to cook. All you have to do is pick out the one you want first. If you want ceramic pans safe for any cooking style these are definitely a great way to go. You’re going to have a 10 piece set when you choose this one, which comes with pots, pans, a skillet, lids and even some of the cooking utensils you’ll need to make that next meal. Everything is scratch resistant, oven safe and even dishwasher safe so cooking the meal is quick and easy but so is the cleanup process. Just throw everything right in your dishwasher and you’re going to be ready to go. Free of toxic fumes and ingredients, you’ll have no PFOA, PFAS or cadmium included in this set. Plus they’re made with aluminum to make sure they don’t warp but do heat up the same way every time, and all over the bottom. These Green Life ceramic pans are definitely a unique but high-quality addition to your kitchen collection. The pans are actually blue on the outside and for the silicone handle, so you can spot them with no problem and you can enjoy the look and feel of them as well. The silicone handle stays cool even when you’re cooking at high heat or when you put the pan directly into the oven. 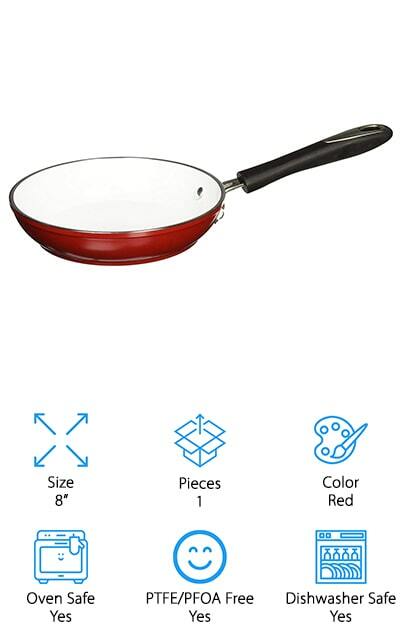 At 12” in size, this pan is coated with Thermolon to provide a non-stick coating that doesn’t have PFOA. When you’re ready to clean up you can put the pan directly into the dishwasher so it’s easier for you to get ready for the next time you want to cook. You can also choose between different sizes and different colors to match your needs and your kitchen. If you’re looking for a good ceramic pans review then this is a great option. 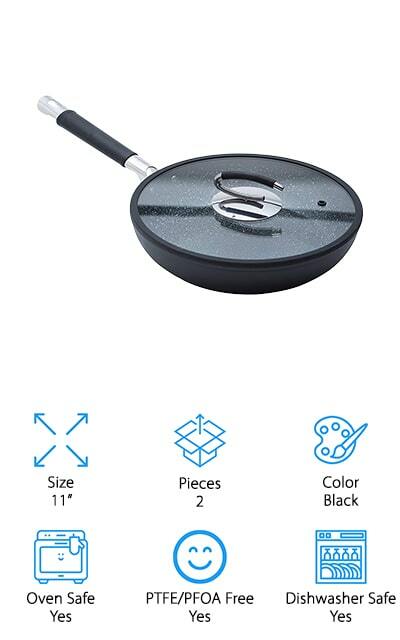 It’s a skillet with two handles to make it even easier to move from your stove to your oven or even to the sink if you need to drain anything. 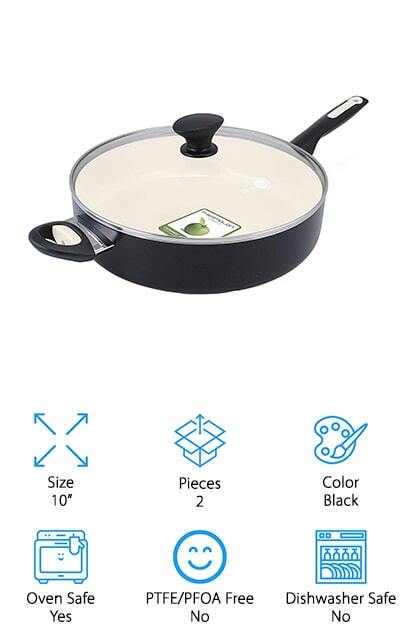 Made with a ceramic interior that’s non-stick and made without PFAS, PFOA, lead or cadmium, you don’t have to worry about anything sticking while you cook. You also don’t have to worry about toxic fumes, blistering or peeling, which can be dangerous for your family. The handles are designed to be comfortable to hold, even when the rest of the pan is hot, and the lid and pan both are oven safe up to 350°F. That way you can transfer it wherever you want and cook your favorite dishes easily. 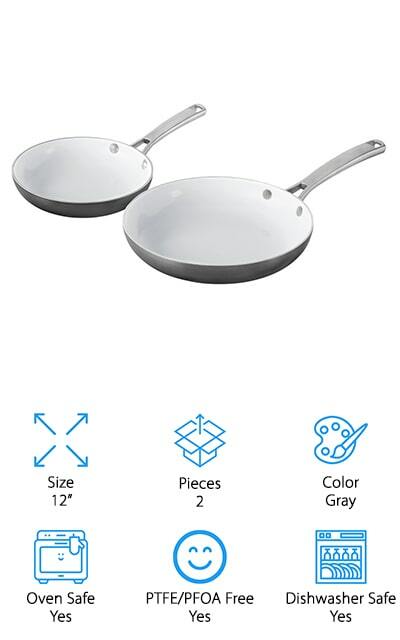 This set of 2 pans is made by a company that’s known for high-quality products. It’s made without PTFE or PFOA but still has a non-stick surface that’s easier for you to clean when you’re done. In fact, you can wipe out the pan and then put it directly in your dishwasher so it’s ready for next time. The aluminum construction of the pan base means that it heats evenly and it’s designed not to warp, even under higher levels of heat. The stainless steel handles are designed to stay cool even when you cook at a high temperature on the stovetop and the pan itself can be put directly into the oven when you need to cook your food just a little bit more, up to 450°F. These ceramic pans are available in 2 different colors to make sure they fit the look and style of your kitchen, but even more importantly they’re PTFE, PFOA, and cadmium free. They’re also scratch resistant, so you can use all of your normal utensils without having to worry about a thing. On top of that, you can put them directly into the oven or into the dishwasher to get them clean and ready again. The ceramic surface can actually be heated all the way to 570°F, but the pan is rated oven safe up to 350°F. You’ll get 2 pans included here, so you can cook a wider range of different foods, and you’ll be able to keep them nice and free from staining as well. That’s because they’re designed to repel stains, even while cooking your messiest dishes.